Discover Banff National Park at the time of year that the locals play and the tourists stay away! 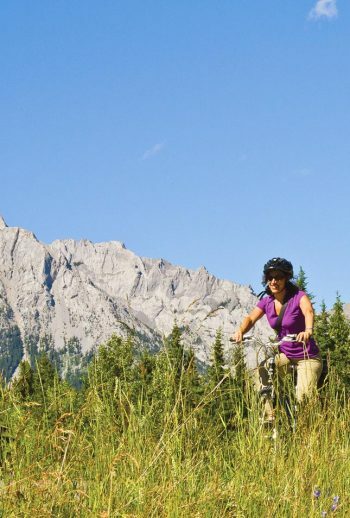 Discover Banff at a time of year when the locals play and the tourists stay away! Banff National Park is truly at the height of its beauty mid-winter when snow-crested peaks serve as a backdrop for powdery adventures like cross country skiing, snowshoeing, and dog sledding. Embrace the wide open spaces of the Canadian Rockies on this all-inclusive winter adventure. When you arrive “home” to your accommodation each night, you can expect toasty mugs of hot chocolate, crackling fires and delectable meals to warm yourself after a day of exploring a winter-lover’s paradise. Snow-crested peaks, tranquil valleys, and ice-covered lakes set the stage for your six-day Banff Winter Vacation. This all-inclusive, meticulously-planned adventure will have you embracing the Canadian Rockies during the most exquisite time of year. Come discover for yourself this wonderful winter paradise. Snowshoe with a bird’s eye view through Kananaskis Country. Expand your mind as you learn about how the mountains were carved and shaped by glaciers. Spot as many different types of wildlife as you can while cross country skiing to Emerald Lake; deer, elk and moose are just some of the animals that frequent the area mid-winter. In your cozy bed at your home away from home, recognize why Baker Creek Chalet received the Banff Heritage Tourism Award for authentic mountain lodging. Take in the views from Lake Louise as you ice skate across the lake’s frozen surface. Learn the ins and outs of snowshoeing and cross-country skiing as your knowledgeable guides pass off a few of their expert tips. Crawl past prehistoric bones, investigate ancient cave formations and try squeezing through a human-sized cave hole. Gee! Haw! Whoa! Mush! Learn the commands of the dog sledding world with a professional musher. Nothing is more tranquil than mountains blanketed in snow, and with our knowledgeable guides, you’ll feel right at home. The rugged landscape and the plush accommodations create a contrast that brings out the best of both worlds. Exploring a system of undeveloped caverns is a once-in-a-lifetime experience. While Alberta is gorgeous regardless of the season, leaving the summer tourists behind means you have all that beauty to yourself. Pick-ups in Calgary. After a drive out of the city and into the mountains, sit down to a quick welcome meeting with your guides. Today’s exciting adventure is dog sledding! You’ll first get an introduction to dog sledding and your huskie companions and instruction on how to safely drive a dog team. Afterwards you’ll glide through mounds of delicate, fresh snow on your journey along trails of alluring hills, tranquil valleys, quaint bridges and breathtaking ice-covered lakes. Once your dog sledding experience is done, we make our way to Banff where we check into our accommodation for the next three nights, Banff Royal Canadian Lodge. Located in the heart of the mountain town, Delta Banff Royal Canadian Lodge is the quintessential Canadian lodge, with a distinctive Rundle Rock fireplace and walls covered in Canadian artwork. The rooms are elegantly appointed with custom-made Canadian furnishings and Canadian artwork. The oversized bathrooms have an Alberta granite topped vanity and full bathtub and shower. Considered one of Canada’s premiere national parks, Banff National Park has been designated a World Heritage Site, renowned for its majestic mountain ranges, and pristine mountain lakes and forests. The Town of Banff is a sophisticated mountain resort featuring excellent shopping opportunities, diverse dining, and fun nightlife spots. Embark on a full-day snowshoe to Chester Lake, a very scenic trail nestled among Kananaskis Country’s towering peaks. If you’ve never snowshoed before, no problem! As the saying goes, “If you can walk, you can snowshoe” as the learning curve is much shorter than that of skiing or snowboarding. Your guides will set the pace, provide some on-the-go techniques and allow you to enjoy snowshoeing through the Canadian Rockies with plenty of time to stop for photo opportunities (which there are many!). After an exhilarating day on the trails, you’ll be ready to sit down to a tasty dinner back in Banff this evening. Today’s adventure involves caving in “Rat’s Nest Cave” (but don’t let the name spook you away!). The wonderful thing about caving in the winter is that no matter what is happening with the weather outside, Rat’s Nest Cave is a constant 41°F (5°C) all year, which is quite pleasant for exploring. This cave is wild and undeveloped, meaning there is no interior lighting, no handrails and no walkways. You’ll discover the rich history of the cave, including how animals and humans have used it in the past, by touring the cave by headlamp and examining stalactites, stalagmites, animal bones and fossils along the way. Take the afternoon off to explore the neat town of Banff or check out Banff Hot Springs. Tonight is on your own to dine in one of the many restaurants Banff has to offer. After a hearty breakfast, we depart for Lake Louise. Lacing up your ice skates on a frozen lake is likely the most iconic Canadian thing you will ever do! Named as one of the “10 most beautiful ice skating rinks in the world” by CNN Travel, Lake Louise is cleared and maintained daily by The Fairmont Chateau Lake Louise for ice skating**. This afternoon, we head out on a snowy hike to Johnston Canyon’s lower and upper frozen waterfalls via suspended catwalks, keeping an eye out for ice climbers taking things to the next level! Transfer a short distance to our next accommodation, Baker Creek Chalet. ** If conditions are unfavorable for ice skating, guests will snowshoe around Lake Louise. Nestled in a peaceful wooded setting, beside Baker Creek, this lodge and cabins blend magically into their surroundings, far from the bustle of Lake Louise. Baker Creek is an intimate casual mountain resort consisting of log chalets, lodge suites, Bistro restaurant and a Heritage Executive Conference Centre. It is family owned and operated year round. Baker Creek is the perfect central location to explore mountain lakes, drive, hike, bike, snowshoe, cross-country ski, downhill ski or just relax surrounded by some of the most famous scenery in the world. Yet another new activity awaits us today when we try out cross country skiing at Emerald Lake. Cross country skiing is truly a spectacular way to experience the gorgeous mountains, fresh air and wildlife of the Rockies. Your guides will give you a quick lesson and then the group is off to glide along the groomed trails of Emerald Lake, surrounded by the peace, quiet and majesty of the Rockies. Tonight, enjoy one last dinner as a group at one of our favorite restaurants. This morning, head out on one last snowy adventure with your guides before returning to Calgary for drop-offs at the airport or your post-trip hotel. Please plan on arriving at least one day prior to your trip departure. Day one of your itinerary starts at 8:00 or 8:20 am, depending on your hotel. Your trip ends with a drop-off at either the Calgary airport (1:00 pm) or your Calgary hotel (1:30 pm). Dog Sledding: No experience necessary. Professional mushers will provide instruction and a safety talk as well as accompany guests throughout the morning tour. Snowshoe with a bird’s eye view through Kananaskis Country. Expand your mind as you learn about how the mountains were carved and shaped by glaciers. Spot as many different types of wildlife as you can while cross country skiing to Emerald Lake; deer, elk and moose are just some of the animals that frequent the area mid-winter. In your cozy bed at your home away from home, recognize why Baker Creek Chalet received the Banff Heritage Tourism Award for authentic mountain lodging. Take in the views from Lake Louise as you ice skate across the lake’s frozen surface. Learn the ins and outs of snowshoeing and cross-country skiing as your knowledgeable guides pass off a few of their expert tips. Crawl past prehistoric bones, investigate ancient cave formations and try squeezing through a human-sized cave hole. Gee! Haw! Whoa! Mush! Learn the commands of the dog sledding world with a professional musher. Come discover for yourself this wonderful winter paradise. The hallmark of an Austin Adventures vacation is our exceptional dining. All meals: breakfasts, lunches, snacks, dinners, refreshments and receptions – except one dinner on your own – are included as indicated by the itinerary. (B = Breakfast, L = Lunch, D = Dinner). Alcoholic beverages and related gratuities are not included in the trip price. Unsure if that adventure in that wild place is right for you? Austin Adventures guide Will Woods will assure you it is, but he’ll also tell you how that trip will change your life, how to prepare for it, and why you should never pass up an opportunity to see breathtaking scenery, do thrilling things, and meet new people. Born beneath the Canadian Rockies in Calgary, Alberta, Will turned his love of adventure into a profession and has spent nearly 20 years building and leading adventure trips for a variety of guests, who all seem to catch his passion for wild places.